The authorities in Mozambique have begun evacuating thousands more people from the Zambezi river valley. The move follows an announcement by neighbouring Zambia that it would release water from the Kariba dam. The water is expected to flow down the Zambezi into areas of Mozambique already struggling to cope with high flood waters. Aid agencies are describing the growing crisis along the Zambezi river valley as going "from bad to worse". Just as the authorities thought the floodwaters had stabilised, the rains have started up once more, says the BBC's Peter Greste. Controllers of the massive dam say they will have to release water or risk having the dam burst in the next week to 10 days. In Mozambique there are already almost 100,000 evacuees and the reception centres are full to capacity. But with the river already at a record high, they are now looking to move another 40,000 as well as having to re-evacuate people sheltering in centres they thought were safe. Chris McAiver from the aid organisation Save the Children says the Mozambican authorities have managed the crisis admirably so far, but the pressure from the continuing rainfall is putting immense strain on the already overstretched resources. Countries across southern Africa - Lesotho, Malawi, Mozambique, Swaziland and Zambia - have been affected by the floods and more people will have to be evacuated. More rain is forecast to fall this month and it could continue into April, the International Federation of Red Cross and Red Crescent Societies said. Torrential rains in Zambia and Zimbabwe have swollen the Zambezi river to well above the flood limits. 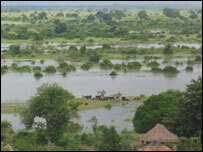 Valleys in Malawi and Mozambique are bearing the brunt as the waters flow down to the Indian Ocean.